HOHENFELS, Germany -- Combined Resolve XI, a biannual exercise that focuses on improving the readiness and lethality of participating units, has wrapped up its first two-week phase, which began on Nov. 26 at the Joint Multinational Training Center in Hohenfels, Germany. The U.S. Army Europe exercise serves as the combat training center certification exercise for regionally allocated forces. More than 5,500 participants from 16 nations interoperated as both friendly and opposing forces; at all levels, the goal was to enhance proficiency of war-fighting functions. Soldiers from the U.S., Lithuania, and the United Kingdom served as higher and adjacent command and control. The three brigades intersected operations planning, exchanged information, and efficiently communicated direction to forces out in the field. Brigadier Dom Biddick, MC, MBE (Military Cross, Member of the British Empire), commander of the 20th Armored Infantry Brigade, U.K., managed the higher command operations center and communication distribution. 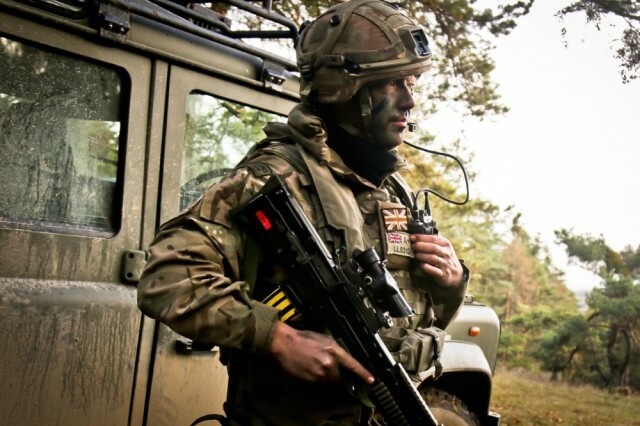 "We are here with a fully-formed U.K. brigade headquarters in command post exercise mode," said Biddick. "We've got the U.S brigade, 1-1 CAV, live in the box here and the Lithuanian brigade piping down. Together, those three brigades provide a full division in the fight." Lithuanian armed forces Major, Alfonsas Bickus, participated in the exercise from his home station through a Joint Conflict and Tactical Simulation System. "It is a good example of how NATO allied countries cooperate and integrate into common training without being sent to one training area,' said Bickus. "At the same time, brigade staff receives all the necessary guidance and orders to initiate their own command and control procedures, sharing the information and expertise between the involved countries." Allies and partner nations aid in the goal of increasing readiness and lethality by bringing congruent yet different assets and capabilities to the exercise. Maj. Paolo Giangregorio, operations officer for 1st Army Aviation Regiment, Italian armed forces, was one of eight pilots that worked alongside U.S. Army pilots to ensure air traffic control and proper navigation of air assets. "We are all pilots from different helicopter lines" said Giangregorio. "Knowing each other permits [us] to know the peculiar points of strength and put them together in order to achieve better results." Interoperability, direction and sharing of knowledge took place in the air and on ground. 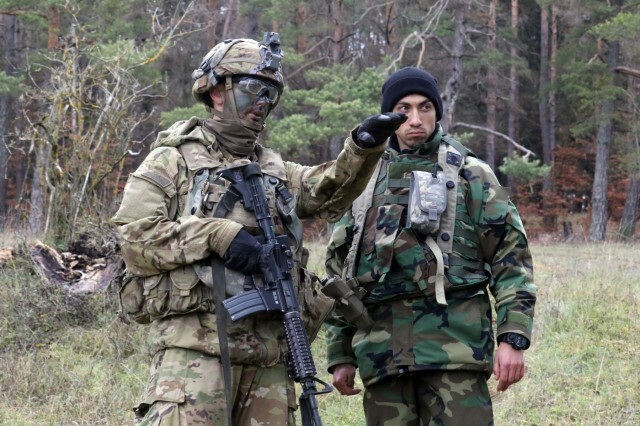 U.S. and Moldovan soldiers complimented each other's skills by joining light and medium infantry tactics to enhance the proficiency of combat skills. "In this exercise, the Moldovans have been providing critical assets which allow us forward maneuver," said 1st Lt. Pierce Baker who served as liaison for Moldova and U.S. Army operations, 2-5 Cavalry Regiment, 1st Cavalry Division. "With this terrain, the biggest thing we've seen is the capabilities they bring to the fight as a light infantry unit. It's critical for providing greater security." 1st Lt. Seremetov Stanislav, team leader for the Moldovan armed forces, expressed gratitude for being a part of the exercise. "We are grateful for this opportunity," said Stanislav. "It is a good experience for our troops and our country. Our collaboration with Alpha Company 2-5 CAV is very good and we are happy to offer our support and also to get a chance to learn from one another." Augmenting maneuvering responsibilities, were the U.S. and Serbian military police. The 615th Military Police Company and the Serbian armed forces served as a quick reaction force and were positioned at traffic control points and entry control points. 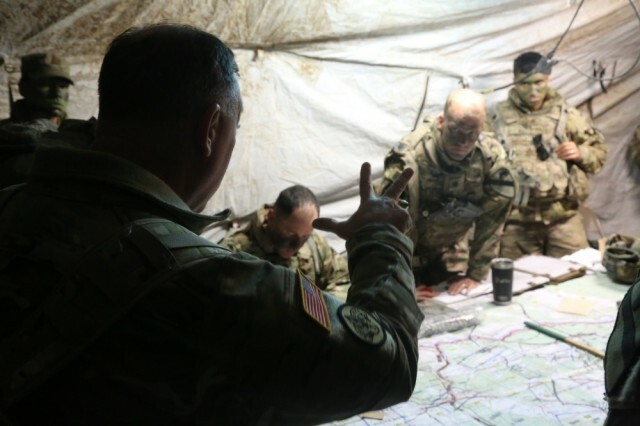 "Some of the main tasks we're doing, the 615th MP and the Serbian MP companies, we are basically doing QRF, doing some TCPs, ECPs and making sure they get from point A to point B safely," said Pvt. 1st Class Dominique Daniels, 615th Military Police Company, 18th Military Police Brigade, out of Vilseck, Germany. During this exercise, the commonality remained transparent and interoperable. 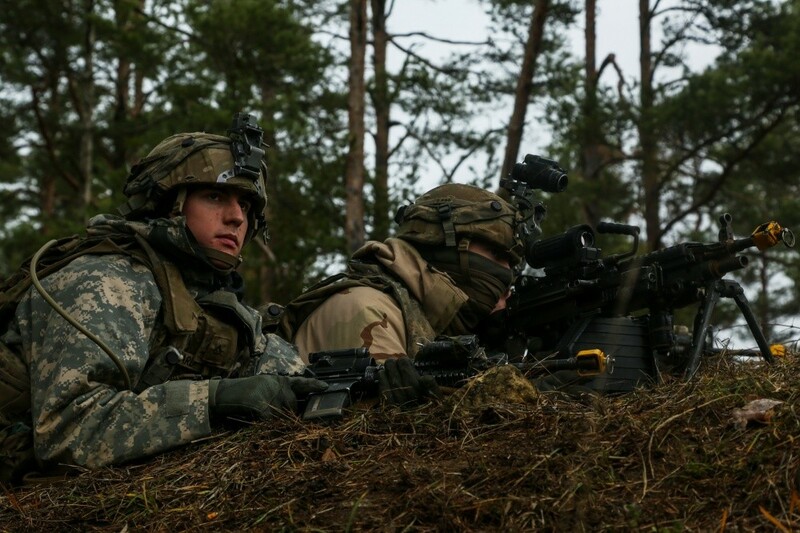 "Interoperability is everything, we are here in an exercise with a NATO headquarters above us, and we've got U.S. comrades to our flank and Lithuanian comrades beyond them," said Biddick. "That exactly how we are going to fight a war if that moment comes. NATO contacts alongside our U.S. and NATO allies. So this is training as you fight." The second phase of Combined Resolve XI will take place Jan. 13-25, 2019 at the Grafenwoehr training area.